W najbliższą niedzielę 15 lipca o godzinie 17:00, na Stadionie Narodowym przy alei Księcia Józefa Poniatowskiego 1 w Warszawie, o tytuł Mistrzów Topligi 2012 zmierzą się Seahawks Gdynia i Warsaw Eagles. Jastrzębie mistrzem po raz pierwszy! W rozegranym w niedzielę 15 lipca NAC VII SuperFinale PLFA drużyna Seahawks Gdynia pokonała na Stadionie Narodowym Warsaw Eagles 52:37. 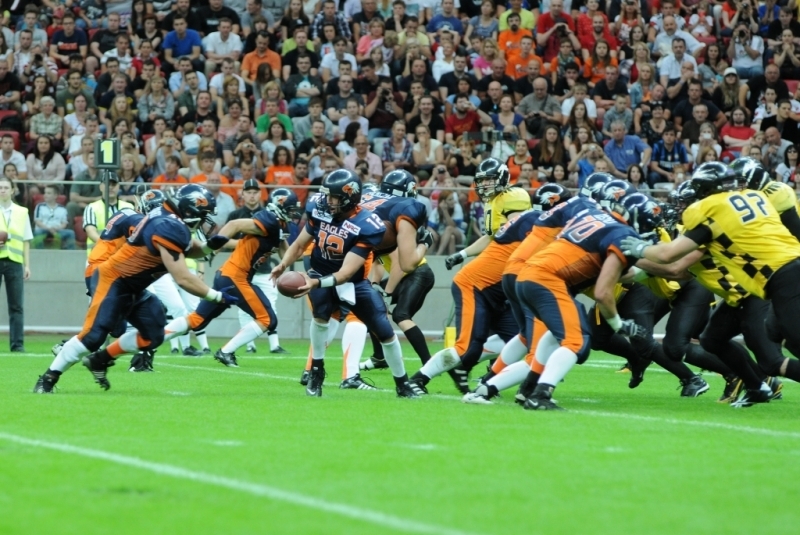 The most anticipated game in the history of American football in Poland did not fail to deliver in terms of entertainment, with the Gdynia Seahawks outlasting the Warsaw Eagles 52-37 in NAC SuperFinal VII. 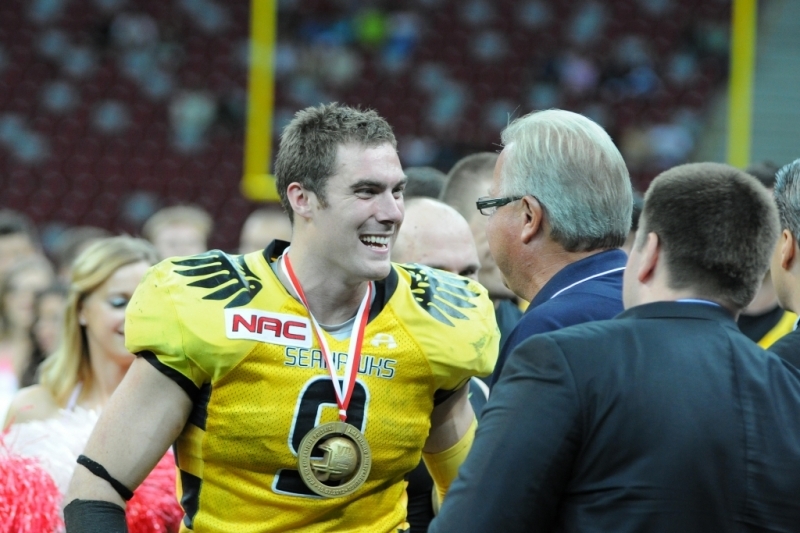 Quarterback Kyle McMahon was named the game's Most Valuable Player for leading the Seahawks to their first title on a spectacular evening at the National Stadium in Warsaw. 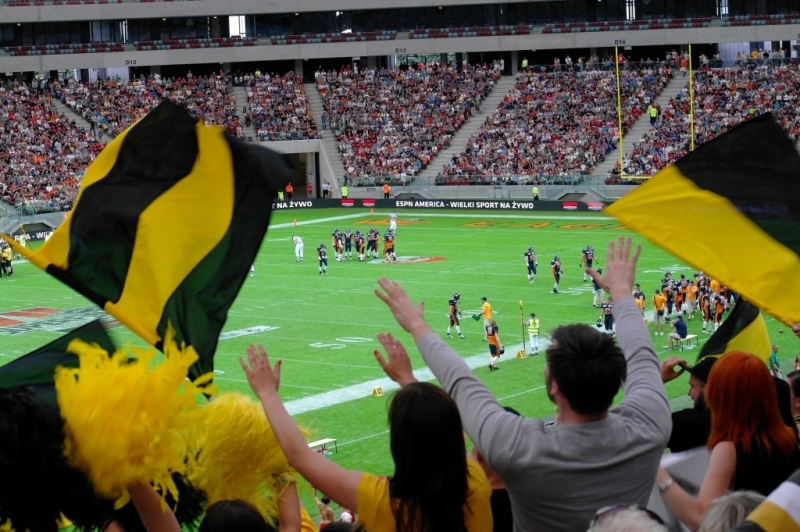 All 23,000 available tickets were sold for the Polish League of American Football (PLFA) championship, making the event a success that even the most optimistic of organizers did not predict. In a scene reminiscent of an NCAA bowl game, large groups of fans cheered touchdowns and big plays by both of the teams. “This is a key moment in the development of football on our continent,” said Tommy Wiking, president of the International Federation of American Football (IFAF). “In 10 years we will all remember the game as a breakthrough.” The game was broadcast live throughout Poland on two different networks, and a replay was shown on Monday evening all across Europe. The Seahawks offense was dominant throughout the entire game, piling up 578 total yards and scoring a touchdown on every drive except for the two that started with little time remaining on the clock in each half. McMahon, who was also named MVP of the 2012 Topliga season after the game, played flawlessly, earning his trophies with another performance that showed what a dual-threat player he is. The quarterback went 20-for-26 for 293 yards and 3 touchdowns, in addition to running for 115 yards and three more scores. For their part, the Eagles stood toe-to-toe with the Seahawks for most of the game, with the two teams trading blows like a pair of heavyweights. Kevin Lynch led Warsaw to a touchdown just before the break and to another one on the opening drive of the second half to pull his team to within 32-30. The Seahawks offense continued to pound away, however, delivering the knockout blow on a 58-yard touchdown run by McMahon in the fourth quarter. “Our biggest problem was that we made too many mistakes,” explained Eagles head coach Phillip Dillon. “We had the right attitude, however, and I thank my players for fighting to the final whistle”. The Seahawks won the coin toss and took possession at their own 20-yard line, before going on an 80-yard drive that chewed up nearly half of the first quarter and ended in the first of McMahon's touchdown runs. Warsaw then committed one of those mistakes alluded to by Coach Dillon, when a Lynch pass was deflected and then intercepted by Jakub Muraszko. Working with a short field, McMahon hit Damian Bijan shortly thereafter for a 24-yard touchdown pass that put Gdynia up 12-0. From that point, the Eagles were always fighting from behind. They found their offensive footing on their next possession, establishing the ground game through Piotr Osuchowski, who gained many of his 58 rushing yards on the drive. Dawid Więckowski punched it in from four yards out to make the score 12-7 at the end of the first frame. The teams combined to score 37 points in the second quarter. Of the seven drives in the quarter, five ended in touchdowns, one ended in a Warsaw field goal, and the final one began with just 12 seconds remaining in the half. The Seahawks looked to be in firm control in the middle of all that when McMahon rolled out and floated a pass up the left sideline to his favorite target, receiver Josh Le Duc, who outraced defenders the rest of the way to a 43-yard touchdown reception that made the score 32-17 in favor of Gdynia. Le Duc finished with six catches for 99 yards. Although he finished only 14-33 passing, Lynch threw for three touchdowns of his own, including an 11-yarder to Tyrone Landrum that cut the lead to 32-24 just before halftime. The key to the Seahawks victory may have in fact been their ability to keep Landrum and tight end Grzegorz Janiak in check all game long. Janiak, who ran wild over the Wrocław Devils in the semifinals two weeks earlier, finished with only two short catches. As mentioned above, the Eagles quickly cut the lead to only two points early in the third quarter, but a conversion that would have drawn them level failed. 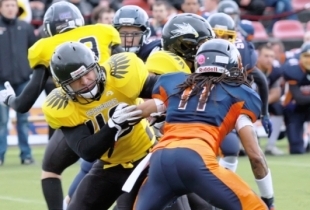 With the Seahawks needing a score to stem the Eagles' momentum, former PLFA MVP Sebastian Krzysztofek stepped up, scoring touchdowns of 16 and 38 yards on the next two Gdynia drives. “Bambo” finished with 139 yards of total offense. The Gdynia defense also came up big in that third-quarter stretch, forcing the only punt of the game in-between those two scores. The Eagles made a final surge in the fourth quarter, pulling to within 45-37 on a short Lynch touchdown run, and then pinning the Seahawks at the 3-yard line on the ensuing kickoff. On this day, however, even that was not enough to stop Gdynia, as it felt as though they could have scored from 197 yards out instead of just 97. After a few first downs that ground the clock, McMahon broke free for a 58-yard scamper that iced the cake for the new champions. 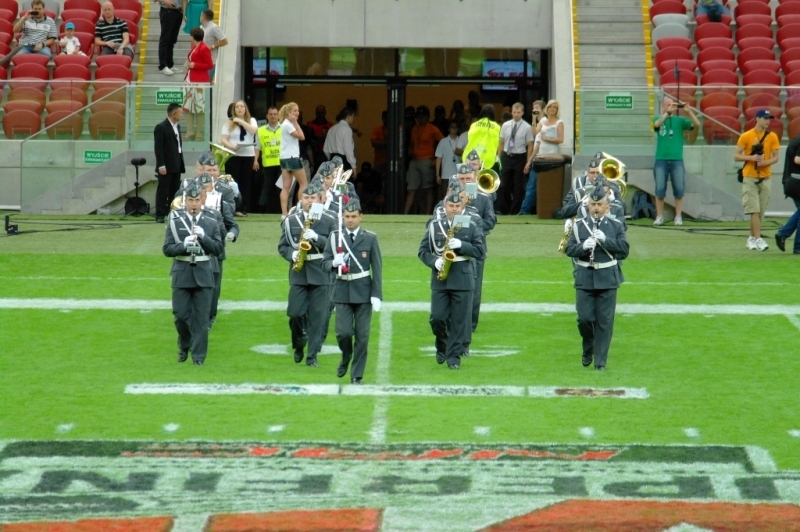 In only its seventh year, the PLFA managed to put on a title game that attracted more spectators than either the European Cup final (the Eurobowl) or any of the past 11 finals in Germany, home to Europe's most successful league. The game drew more than 20 times the number that came for the first-ever Polish championship, and it was fittingly played by the same two teams. The difference is that this time it was the Seahawks who emerged victorious. The Topliga will return in the spring of 2013, but football in Poland is not done for 2012! 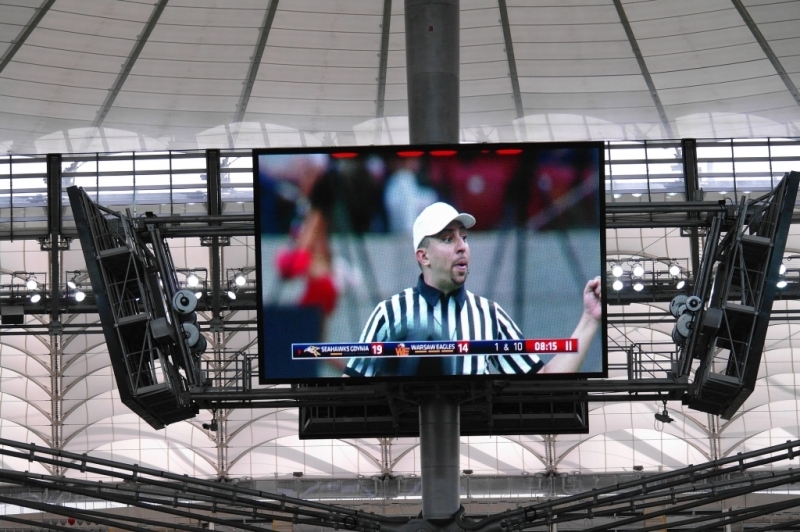 Stay in touch with the sport through the upcoming PLFA I playoffs, the end of the PLFA II season and a series of eight-on-eight tournaments played by some of Poland's newest teams.